Dino arrived on Saturday 10th June 2017 and went to his new home the same day. 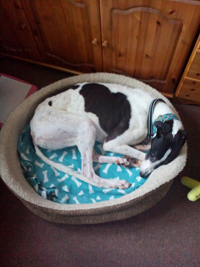 Dino is a white and black ex-racing greyhound who is nearly 3 years old, is cat trainable, neutered, inoculated, microchipped and weighs about 29 kg. He walks nicely on the lead, travels well in a car and has a very laid back nature. "Dino is settling into home life and having lots of new experiences inside and outside without any major problems. He is still learning table manners (he thinks any food on the table is his) but is improving. The cats have not left home yet. Dino still on lead and muzzled when they are in the room but he can now walk near them without reacting. They will also sleep when Dino is in the room now. The grandchildren think he's wonderful. "